Back then we were called Women Marines, WMs or BAMs. We told ourselves that BAM stood for Beautiful American Marine, but we knew better. I was assigned a 0102 MOS [that’s military occupational specialty] as a Personnel Officer. When I arrived at my first duty station in the Mohave Desert, I was introduced around the headquarters building, where I would be working. A crusty Lieutenant Colonel called me aside and handed me a business card. It said, “I’ve had a vasectomy.” I had just been through a few months of hell where us Second Lieutenants were put in fear of senior officers and taught to do as we were commanded. Thankfully, I had the strength to say “thank you,” and walk on. Then I went back to my quarters and cried. After a few weeks, I received a phone call at work from the President of the Officers’ Wives Association. She said that several people saw me eating lunch with one of the Marine Officers (who happened to be my boss) in the Officers’ Club. She suggested that I should refrain from doing that in the future. She didn’t say why. She didn’t have to. I think it may have been an experiment, but “they” decided to give me an opportunity to be assigned to a combat unit, and I became the Adjutant of the First Field Artillery Group. There wasn’t much danger; the war in Vietnam had ended, and the bigger threat was off base. 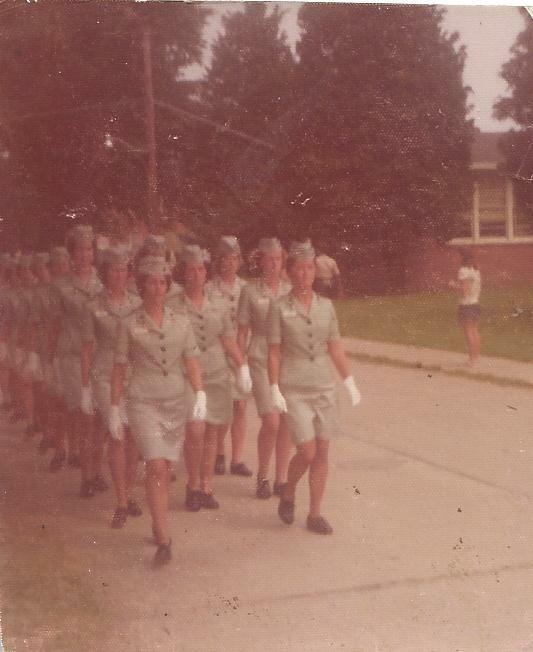 We couldn’t wear uniforms off base because of the strong anti-military sentiment post-Vietnam. I walked down the hill to join my new unit, headquartered in an aluminum Quonset hut. As I walked down the hall to the Commanding Officer’s office to report in, I noticed that there were two heads [bathrooms]. One said “Officers,” and one said “Enlisted.” When I asked where the female head was located, they pointed up the hill to the Officers Club. I trudged up the hill, which was great for keeping in shape. A couple of weeks later, a Captain came over to me and said, loudly and in front of my Marines, that I had no business being in “his” Marine Corps and he planned to make my life miserable. The Colonel did stand up for me. Sort of. All in all, I did pretty well as a Woman Marine officer. I use that term because what I did bears no resemblance to what female Marines do today demonstrating physical and emotional strength I cannot even imagine. Those anecdotes I just shared are pretty mild, but they were traumatic for me. I was thankful to have a champion who helped me see that I would fare better by simply ignoring the a$$holes. That served me well because I found a$$holes in the civilian world as well; lots of them. My purpose in telling this story is to say that most of these a$$holes would have been quite happy to mar my career. Thanks to my champion and a little tough love, I didn’t let them. I chose to move on. And I became resilient. I don’t want to rewrite that history. Were those a$$holes wrong? Sure they were. They were mean, rude and clueless. They had no sensitivity to what their actions might mean to others. Today, we are all significantly more sensitive, thanks to the media, but a$$holes still exist. And those folks may have something good to offer. Honestly, that Captain who told me I shouldn’t be in his Marine Corps was a good officer. Misguided in social skills, but he believed what he said with a passion. I’d follow him into combat, and that’s why the Marine Corps exists. We all have different beliefs, different histories and different contexts that have helped us become the person we are today. There is strength in those differences, and there is knowledge to be gained from history. Why, in heaven’s name, would we rewrite history to erase all of the trials and tribulations that made us who we are today? Today, women in the Marine Corps are called Marines. I am proud to call myself a Marine and feel like I had just a tiny part in where the Marine Corps is today. ← Where was HR when….? Carol, thank you for sharing your story. I cannot imagine myself having to deal with the same experience and you and other brave women have gradually moved us to this tipping point we are now seeing with regard to sexual harassment and civil treatment of all people. I appreciate your kind words. I am very grateful for my time in the Marine Corps, as I did develop resilience.